Flat Stanley is back to save the day in the twelfth exciting Worldwide Adventures chapter book, just in time to celebrate his fiftieth anniversary! This time, we follow Flat Stanley as he explores San Francisco, California. The Lambchops are on a family vacation to San Francisco. But when Stanley saves a girl from barreling down one of San Francisco’s steep hills in her wheelchair, he’s shocked to find that she’s actually been looking for him. The girl, Lily, is trying to perform an amazing trick that no one has done before—escaping from Alcatraz prison—and she needs Stanley’s help! Can the famous flat boy help in this sticky situation? 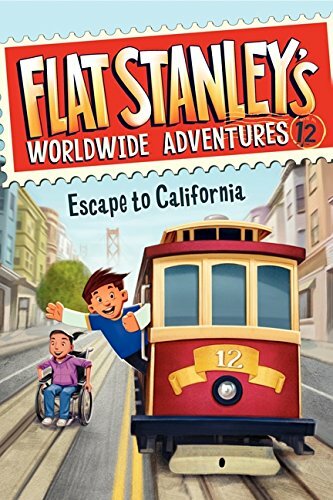 Not only will kids love going on a fun adventure with Stanley, this installment of the Worldwide Adventures series has fun, fascinating facts about San Francisco in the back of the book, and is perfect for Common Core State Standards, like multicultural adventure, plot and character development story elements, and compare and contrast.